Law enforcement and emergency responders face dangerous threats and situations daily. There are many different technologies to sense and image this myriad of threats that can provide these first responders with critical life-saving information. These threats vary from place to place and vary as the entity employing the threat develops more sophisticated methods to avoid detection. The Security Technology Group develops the measurement science to support the innovation, advancement, and deployment of the technologies used to sense and image these threats. Threats to our personal and collective safety abound in our society. 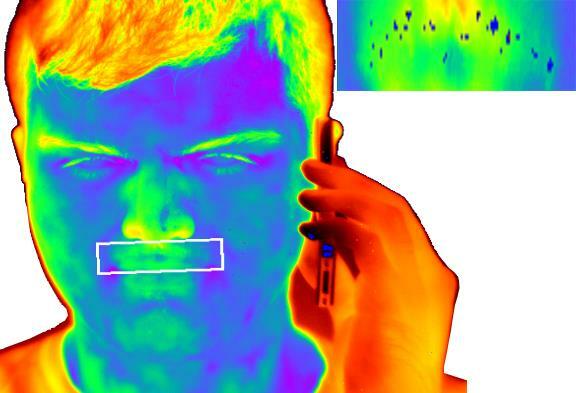 The STG conducts and performs research to advance the technology and measurement science of concealed threat and contraband sensing and imaging. This work includes the establishment of test and evaluation tools, reference test beds, test artifacts, and documentary standards through leadership in standardization bodies. The STG currently has detection projects in millimeter-wave imaging, x-ray imaging, infrared imaging, through-barrier radar sensing and imaging, and metal detection. Figure 1. 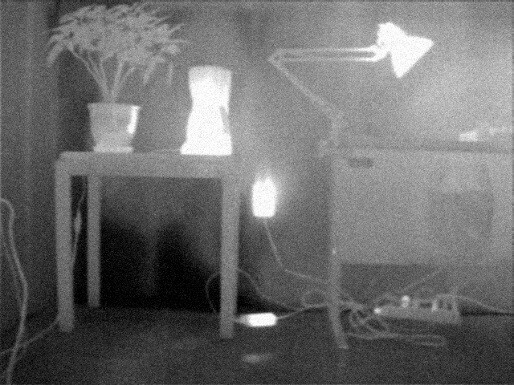 Sample still images from a video taken using the NIST 350 GHz passive imaging system. A ceramic knife hidden beneath a button-down cotton shirt is visible on the left of the image. The darker line running down the center of the shirt is due to the extra layer of cotton backing abd the buttons; this additional cloth produces more attenuation of the warm light from the body. g of actual threat objects in typical operational scenarios. This operational threat-based performance T&E is not a rigorous and objective scientific approach but one that provides assurances on the probability of detecting a threat object or contraband item for a given scenario and application, and representative of a specific time. The problem with threat-based operational T&E is that the threats are constantly evolving, different agencies and locations of agencies may have different threats and contraband they are trying to discover, and the actual threat object may be dangerous (such as explosives, flammables, etc.) or their manufacture and construction changes thus changing the characteristics of their discovery. Furthermore, threat-based testing, because its output is statistical information on sensing/imaging performance, often requires large amounts of data, which can take a long time to accumulate and be very costly. However, threat-based testing is the basis upon which a sensor and/or imager should ultimately be selected for employment for a given application. On the other hand, objective laboratory-based testing can provide a means by which the performance of a sensing or imaging system can be rigorously, objectively, reproducibly, and accurately measured. Lab-based testing supports product development and technology advancement by providing accurate information upon which changes in hardware and software can be assessed, supports product comparison and selection by providing a common set of performance metrics and their test methods, and supports site acceptance and continual assessment of procured products by providing tools for period and routine assessment. Lab-based objective testing often results in a documentary performance standard, with associated test methods, that describes the minimally-acceptable performance of the technology. Such standards are beneficial to the stakeholder community in several ways: for those that do not have the resources for an independent T&E activity, this provides the lowest performance of the technology that should be acceptable for use; for agencies with independent T&E, it can significantly reduce the number and types of tests they perform; and for all, it provides a common language for communication and comparison. Our focus is on the development of the metrology to support the development of objective T&E tools and protocols and documentary standards. Millimeter-wave for application in security screening and imaging has been an area of intense research over the last few years because of the possibility to confer both acceptable spatial resolution (mm-level) and penetration of clothing and some packaging materials. There are both active and passive designs. The STG in collaboration with NIST Div. 687 has developed a state-of-the-art passive millimeter-wave imaging system based on cryoelectronic sensor arrays. This system will be the basis for the development of NIST’s millimeter-wave imager metrology, including the development of test artifacts, test and evaluation protocols, and international documentary standards. Figure 2. 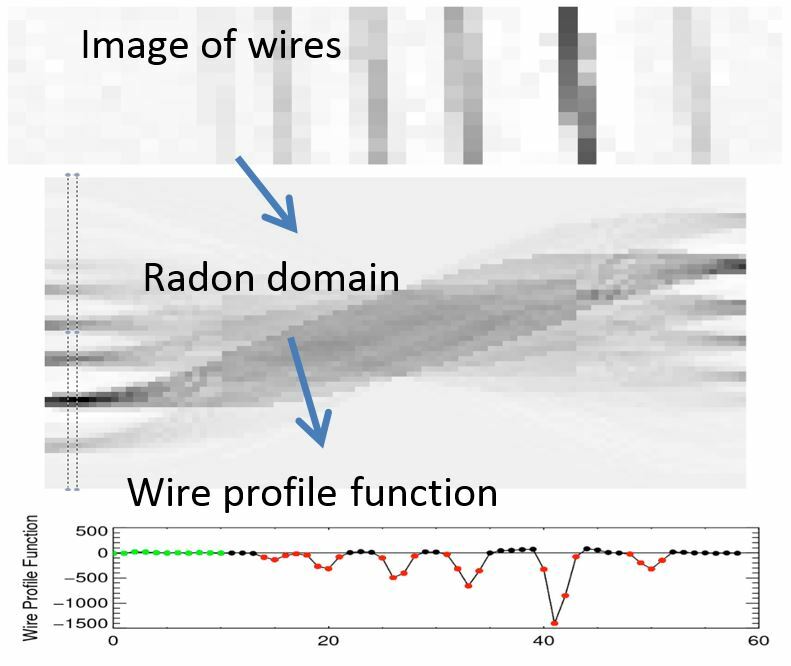 X-ray image of wires, the Radon transform of that image, and the corresponding wire profile function that is used to define "useful penetration." transportation security to detect concealed objects, including threats and contraband. Perhaps the most prevalent use of security and safety imaging is made in aviation security. 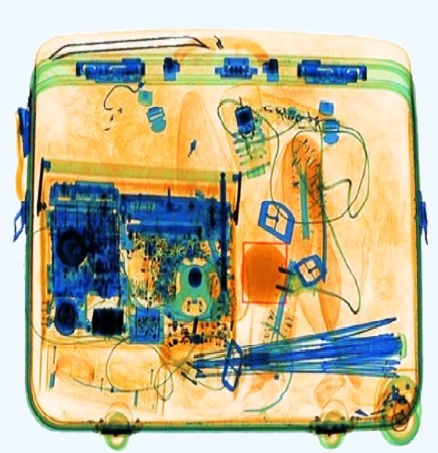 In US airports alone, millions of bags are scanned every week using x-ray systems. Domestic bomb squads and military explosive ordinance disposal teams also use x-ray imaging as a key tool in their efforts to identify explosive devices and render them safe. The NIST Security Technologies Group conducts research and develops standards and metrological tools to assist these stakeholders as they continue to use x-ray imaging technology for security purposes. Figure 3. X-ray image from a cabinet x-ray system of briefcase. Figure 4: LWIR image with added Gausian white noise. The electrical outlet is hot and a fire hazard. large, from about 700 nm (near IR) to 1 mm (far IR), the STG addresses those IR bands of the greatest importance to the safety and security communities. These bands are the near IR (NIR, about 750 nm to 1.5 μm), typically used for perimeter/site/building security, both indoor and outdoor; and the long-wave IR (LWIR, about 7 μm to 15 μm), typically used in outdoor security applications, long-range surveillance and intelligence gathering, and firefighter applications. NIST is developing the metrology to establish objective test and evaluation protocols for these imagers and, in collaboration with the University of Texas – Austin, possibly developing new objective image quality metrics, and develop methods for correlating these new metrics or traditional image quality metrics to human task performance. 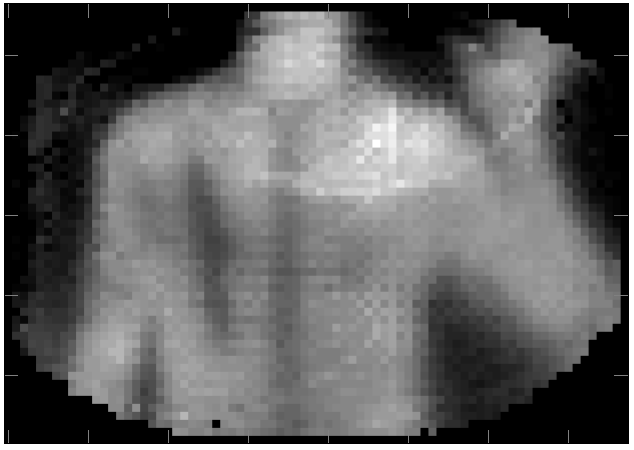 Figure 5: MWIR image showing stress-induced perspiration spots. Through-barrier sensing and imaging provides the ability to see through nonmetallic optically opaque barriers, such as walls or rubble, for location and tracking of people and imaging of behind-barrier scenes, and can be achieved using radar-based systems. Applications and users of through-barrier radar include law enforcement, military, and emergency response. NIST is conducting research in through-barrier radar to advance metrology associated with this technology that will ultimately lead to the development of performance standards. Through collaboration with industry and the user community, NIST is identifying the critical parameters which may be used to quantify the performance of through-barrier radar systems. NIST operates laboratory based through-barrier radar detection and imaging systems to develop test methods and test objects to measure these critical parameters. Additionally, NIST is developing a library of sample walls that are representative of commercial/industrial and residential construction for use in through-barrier radar testing and measurement. Metal detection is the most commonly-used technology for finding metallic threats concealed on people. Hand-held metal detectors (HHMDs) and walk-through metal detectors (WTMDs) are common at almost all security checkpoints worldwide. Other types of metal detectors deployed in security applications include hand-worn metal detectors, that are donned similarly to gloves or strapped to the palm, and ground search devices, similar in operation to treasure-seeking metal detectors but designed specifically to find items related to threat objects.